I’ve been a slacker when it comes to breakfast lately. During the school year we have a pretty set regimen. No matter what time each kid wakes up, I start banging around in the kitchen by 7am. I have a rotation of pancakes, waffles, croissants, crepes and variation of egg recipes – scrambled, egg sandwiches, over easy. Quiche, bagels, bacon, sausage, yogurt. All meals morning meals are served with a side of fruit either plain or in a smoothie. Sometimes I feel it’s too much bread, especially the bad white stuff, but at least it’s not processed. Lately I’ve slipped down another level. The twins seem to wake up with the sun. This morning it was 5:40! And Ben, without the kitchen banging, slept until 8:15. We try to keep the kitchen quiet until all the kids have woken up, but with such a large spread in time, they are begging to be fed. Seems like there have been way to many mornings with processed pop tarts, fruit bars, and granola bars. Even though I assuage my guilt by buying Organic Pop Tarts, Trader Joe’s This Strawbery/Blueberry/Fig walks into a bar, and Organic Granola Bars, stuff with no dyes, no BHT, and not a lot of preservatives, I still feel guilty by the mere fact that they are processed. Then this week I hit my limit trying to find the organic granola bars with chocolate chips on top but without nuts. I broke down and made my own. They have only FIVE ingredients, are easy to make, contain no secret added sugars or words that I have to look up on the computer to understand. I felt much happier serving these babies to my boys this afternoon. 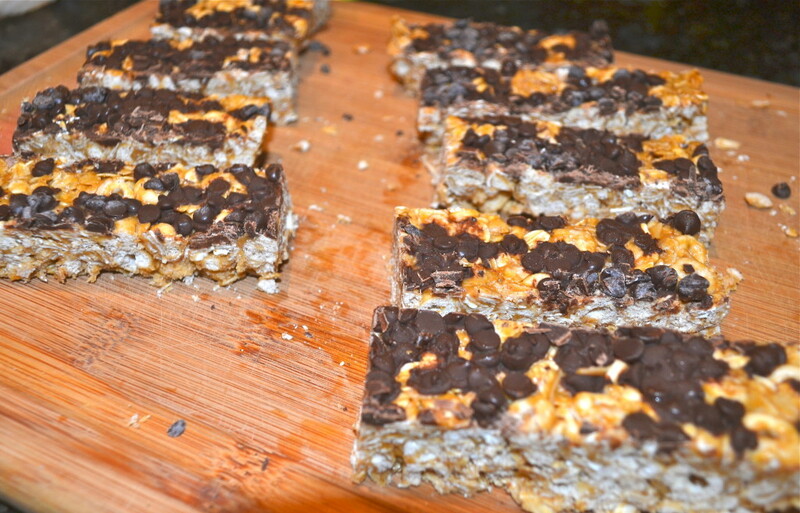 Do you serve your kids a lot of granola bars? These a great start to the morning, a great afternoon snack and pack well in lunch boxes. Five ingredient granola bar great for the morning or an afternoon snack. Line 8x8 pan with tin foil. Combine oats and cheerios in a large bowl. Heat honey on burner until bubbling, add peanut butter. Once peanut butter is melted take it off the heat. Working quickly, add honey peanut butter mixture to oat cheerios mixture. Stir to combine. Press mixture into 8x8 pan. Press hard! Add mini chocolate chips to the top and press again. Freeze for 2 hours, slice into bars.